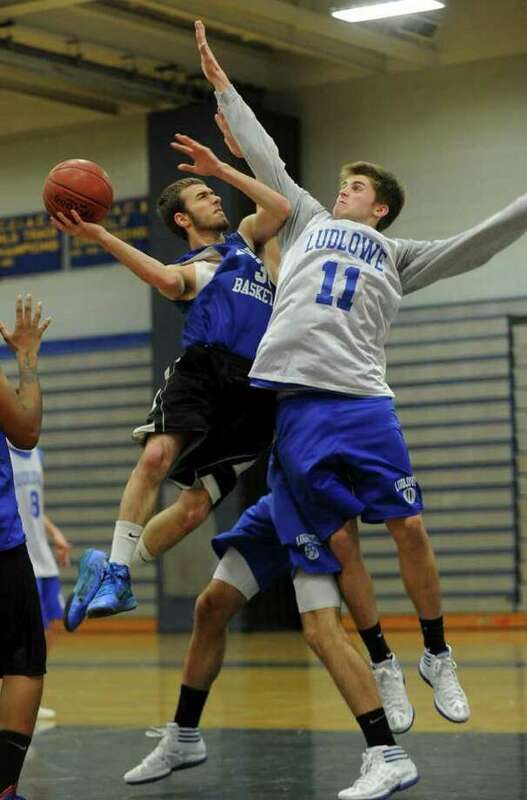 In Brian Silvestro's second year as Fairfield Ludlowe boys basketball coach, the Falcons are going to have to be more offensive. The Falcons were 9-12 a year ago and lost their playoff opener at E.O. Smith. But lost their two top-offensive threats. Co-captains Erik Krumins and Kevin Bentivegna both graduated, with Bentivegna off to Union College. Still Silvestro is more confident in himself in year two. "I've learned some organizational things," Silvestro said. "And I feel like we're making better use of our time." He also believes in his three captains. Senior Marc Cerulli is the Falcons' top returning guard and also a threat to get to the rim. Cerulli will use his speed and agility with fellow-captain David Kinsley's size and tenacity. The Falcons third captain is senior Justin Berardino, who can hit jump shots when he's on. Defensive intensity will be the club's forte. Ludlowe held teams to 57 points per game a year ago, and Silvestro expects that to go down. "Night in and night out I expect us to be very good defensively," he said. Silvestro is concerned the trio will have to score this season. Last year Cerulli, Berardino and Kinsley were role players who deferred to Krumins and Bentivegna's slots as offensive stars. "They were reluctant offensive players last year," Silvestro said. "Everyone has to contribute, everyone has the green light." Tyler Bulkely, Connor Peterson and Patrick Gutierrez will add to the team's depth, although Gutierrez and senior Sam Hauslaib will start the season injured. Silvestro has been pleased thus far with his club's effort and how it continues to grow. "They've done everything we've asked of them," Silvestro said. "I'm cautiously optimistic." The Falcons reached nine wins a year ago, despite having to navigate through the extremely difficult FCIAC. Silvestro did point to the fact that the predicted "upper-tier" teams have to play the Falcons in Fairfield this year. "The premier teams all have to come to our gym," he said. Silvestro just hopes his team is able to win eight and make it two straight years in the Class L state tournament. "Reaching the state playoffs is the goal," he said. "Anything else would be a bonus."